Manal Naji Mahmoud Ghanim, from Tulkarem Refugee Camp, was released after she had spent 4 years in the Israeli jails, mostly in Hasharon prison. A large number of people welcomed her at the Jbara barrier near Tulkarem Refugee Camp. Manal 31 years old, mother of four, was arrested on 17 April 2003 by the Israeli army and sentenced in a military court to 50 months' imprisonment. Manal, who suffers from Thalasemia, was arrested when pregnant and at the end of September 2003, gave birth to her son Nour. Nour had lived with his mother in prison since he was born until 11 May 2006, the date that the prison authorities separated him from his mother. Since then he lives with the family in Tulkarem Refugee Camp. In March 2005 "Addameer" (Addameer Prisoners' Support and Human Rights Association, situated in Ramallah) launched a campaign to release Manal Ghanim, "Women's Organization for Political Prisoners" joined the campaign. The Israeli authorities refused to consider Manal's hard circumstances and rejected her appeal for early release even after she has served two thirds of her prison sentence. Nour was separated from his prisoner mother, Manal . 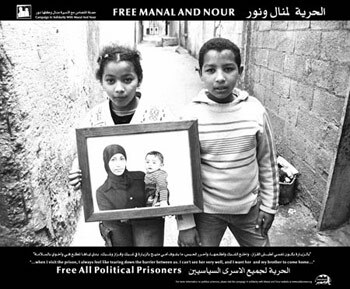 On 4 January 2006, the District Court in Tel Aviv rejected Manal Ghanim's appeal - presented by her lawyer Mahmoud Hasan - against the refusal of the Parole Board to release her after she has served two thirds of her prison sentence. Before the court session started, dozens of peace activists, invited by WOFPP, demonstrated in front of the court building asking to release Manal and all the political prisoners. Women's Organization for Political Prisoners (WOFPP) joins the campaign launched by Addameer (Addameer Prisoners' Support and Human Rights Association, situated in Ramallah) to free Manal Ghanim. Below is WOFPP's petition calling for the immediate release of Manal. We invite you to join this petition as a private person and/or an organization. To join the petition send your name and/or the name of your organization to: WOFPP or call: +972-3-5227124. Manal Naji Mahmoud Ghanim, 29 years old, mother of four, from Tulkarem Refugee Camp, was arrested in April 2003 by the Israeli army and sentenced in a military court in the occupied West Bank to 50 months in prison. Manal, who suffers from Thalasemia, was arrested when pregnant and shortly after that gave birth to her son Nour. Nour is now a year and half old. Both are held in Hasharon Prison (Telmond). The prison authorities do not provide Manal and her son with the necessary medical care, nor do they provide Nour with adequate food or toys. The prison authorities even refuse to let the family bring any toys for Nour. In addition to the daily suffering in prison, it happens, as on November 28, 2004, that the wardens attack the women prisoners with tear gas and water hoses. While such a violent act represents severe harassment for all the prisoners, for a baby it actually is a real danger. In fact, Nour was ill for at least six weeks following this attack. Manal has another two sons and a daughter. The younger boy, 7-years old Maged, suffers from sickle cell anemia. Due to his health condition, he needs hospitalization every ten days. At these times, Maged desperately needs his mother's support. We, the undersigned, are seriously concerned about the deterioration of Manal's, Nour's and their family's health, caused by Manal's continuous imprisonment. We demand to immediately free Manal Naji Mahmoud Ghanim. At present there are more than 2,000 signatures.